Last week I found a vintage Brownie Hawkeye Flash Model camera for $8 at a consignment shop. I used a handy link from Pam's House of Hawthorne's blog on Brownie cameras. The link led me to the www.brownie-camera.com website where I found my (new) old camera. This Brownie was produced from May 1949 until it was discontinued in July 1961. This model was one of the most popular cameras of its time, and is still popular as it is easy to use and still affordable. This is the type of camera that my Mom used to take my pictures when I was a child. I am buying back my childhood again! I found this Brownie camera under the cloche at a garage sale last summer for $1.50. The Brownie Starflash was produced between 1957 and 1965. The familiar square black and white photograph taken with a Brownie camera in the mid 1960's. Here I am in a gunny sack Indian dress, yarn wig, headdress and beads made for my girl scout Halloween party by my Grandma. My little brother is on the right. 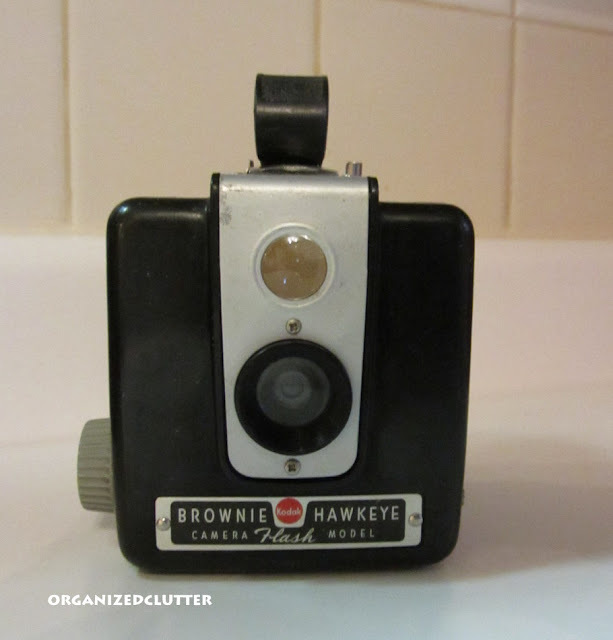 Do you collect Brownie cameras? I collect cameras....I only have four, but would love to add to the collection at any time! You have two great brownies...that is what my mom and dad used! My daughter collects cameras. I love the one under the cloche. BTW I saw your comment on Marty's blog. How do you make your header in Picasa. I do not have any of the other programs, but I do edit my pictures in picasa. Can you tell me how the header is done?? 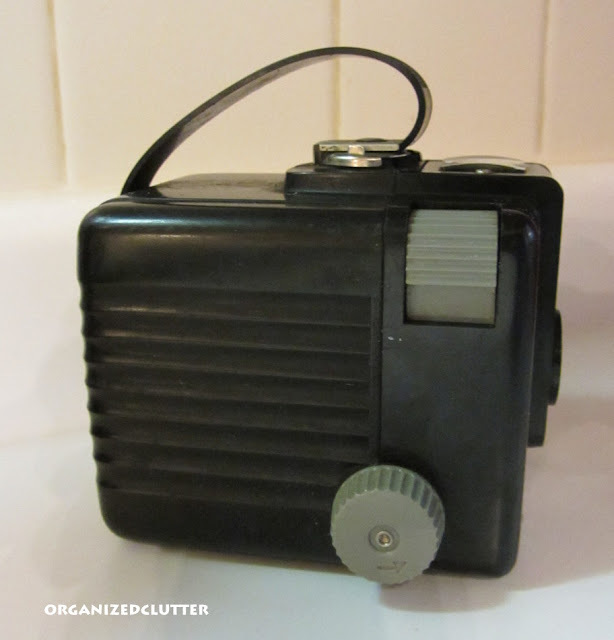 I am so jealous, as I am on the lookout for old cameras.. love both your fabulous finds! Please come by my new blog, The Pink Geranium, I would love your feedback! Hehe! The Halloween photo looks just like the pictures of my siblings and me dressed up in our handcrafted costumes. So cute! I had a few old cameras, but they've been farmed out to our daughters. I have three old cameras. Two are Brownies, I think.....not at home to look for sure. I just love them. You got some really good deals. I love old cameras...such a great look! I don't collect them myself, but when I find them, they always are great in my booth! Thanks so much for stopping by my ideas house posts! I have the 65 model! I was so proud of it! Got it for Christmas. Used it for years. When I was closing up my parents house, I found the little Brownie in Dad's office. He'd kept it all those years. . .Thanks for the memory. . . Thanks for the shout out! Love the cameras, but your Halloween outfit is too cool. Love it! The one under the cloche is just like one we had growing up. Love that camera and the little square photos. You are adorable in your indian outfit! Carlene what a cute little Indian girl you were! I just started collecting cameras about 8 months ago. I have 4. Not sure what makes they are. I need to check them out. One is a movie camera and one is very old with the accordian lens that pulls out. Love yours and the cloche is darling. 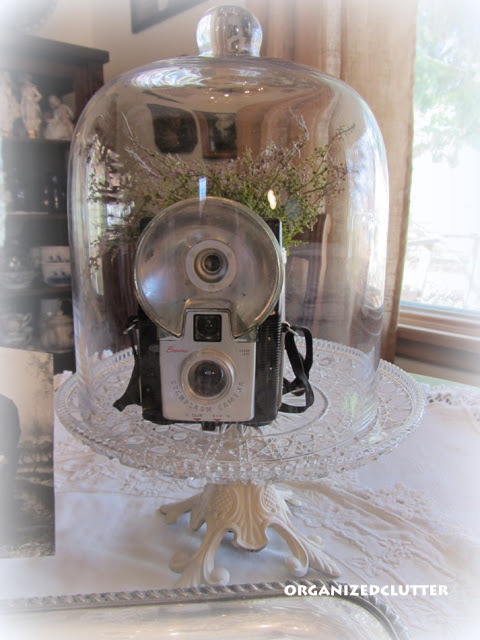 Thanks so much for sharing your brownie cameras on Simple & Sweet Fridays. Happy Halloween!